Hardly time to post today. Just too busy trying to make a dent in my UFO for this month. 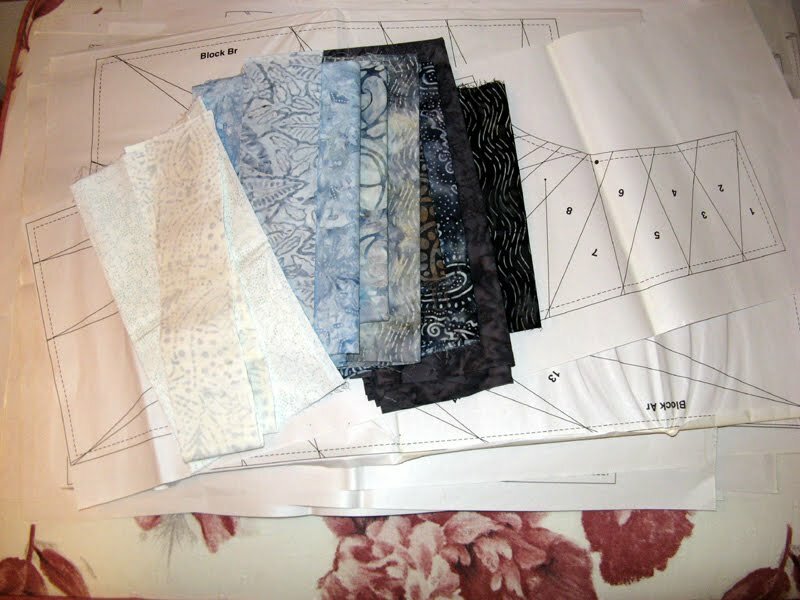 This not to say getting my sewing room back to normal for me to work in. This is just a part of the huge project Kayenne is turning out to be. These units are so long. 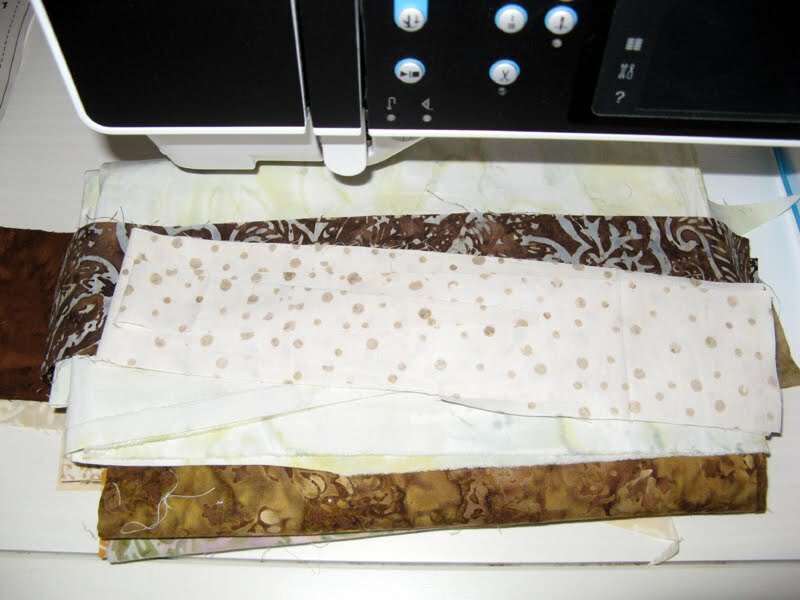 After struggling with the background on the black unit...it was all pulled out and replaced with the creamy background (instead of whiteish fabrics). I definitely do like it better. 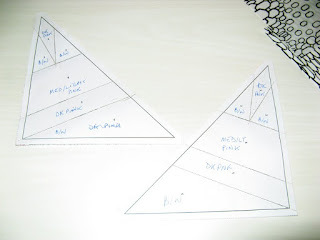 I took time to create templates, which definitely makes the stitching swifter. I will be working on it through tomorrow, but certainly it won't see a finish this month. This is Kalvery Month 5 finished. One of my retreat projects. This is what it looks like at present. Next up at the retreat was to complete Months 4 and 5 of Konstitution. I never did get to Kanton Kull like I had hoped. Oh well that will be another time. 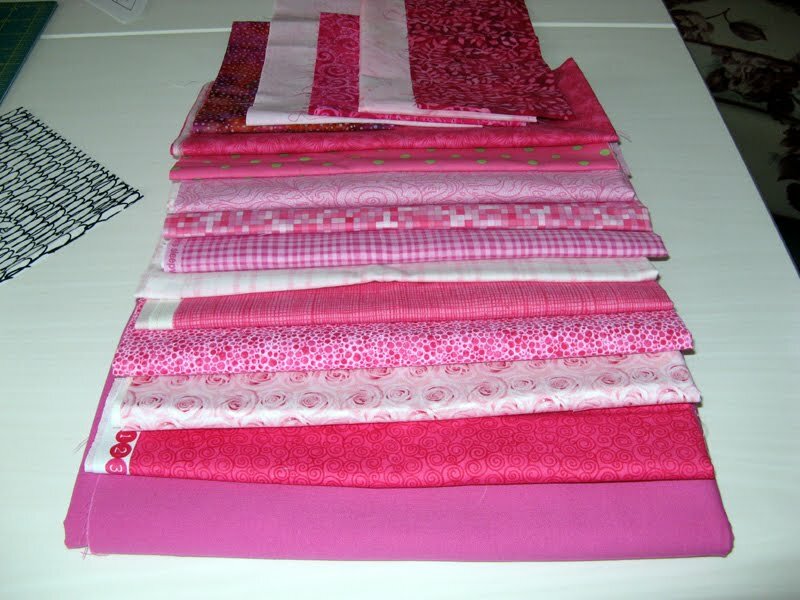 So what have you got going on in your sewing room? 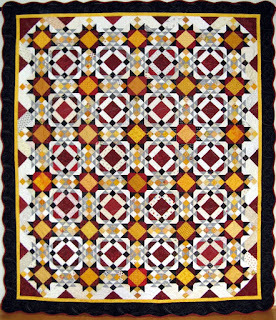 See more through the links at Patchwork Times. 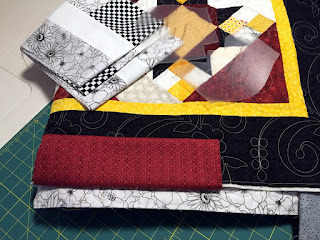 Mom and I went to Beverly's to pick up some thread before the quilting retreat...guess what happened? 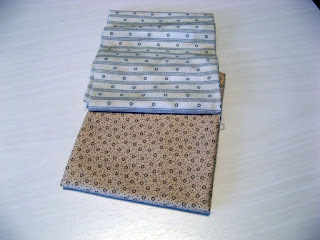 The fabric on the top was a nice find in the sale rack for a future backing. 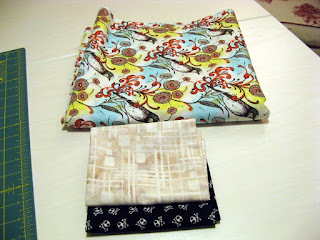 I picked up a couple of fat quarters too that will be used in two projects currently in work. Then came a shopping spree at Primitive Gatherings. What a fabulous shop! 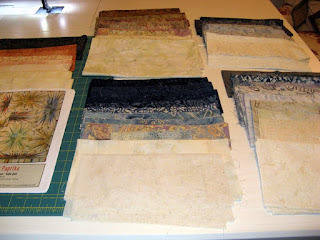 I picked up a bunch of FQs; ten as a matter of fact which gave me two more free. I kept the freebies and Mom has the rest that are all novelties that she will use on future projects. Then came two terrific kits. The top Winter-ific and the bottom Clover. The shop offered a 25 percent off one item for coming to their shop from a quilting retreat put Winter-ific in my cart. 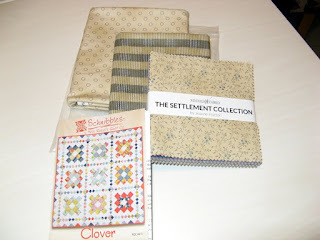 Because it was Memorial Day weekend another 25 percent off project put Clover in my cart too. Saturday Mom and I spent the day with Kerry. 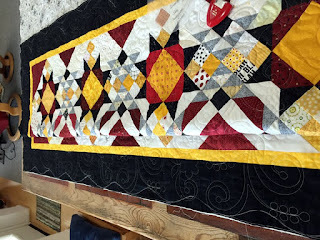 It is always fun to get quilts back finished when I visit. Krystals (Snowy Day by Bev Getschel) and Konstellation and Krown (Star and Crown by Pat Speth) came home with me. 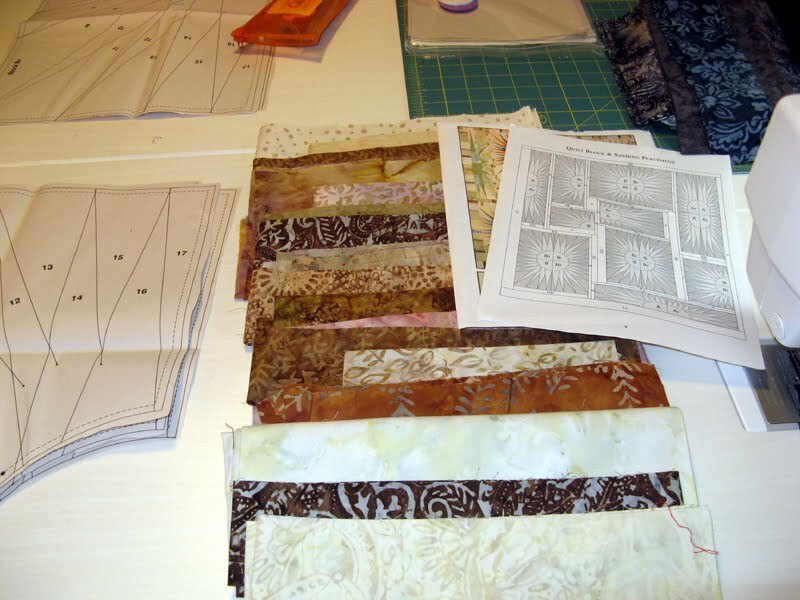 They are both trimmed down, binding is ready for stitching as well as the sleeves. Today is Mom's fifth day of her three week stay. 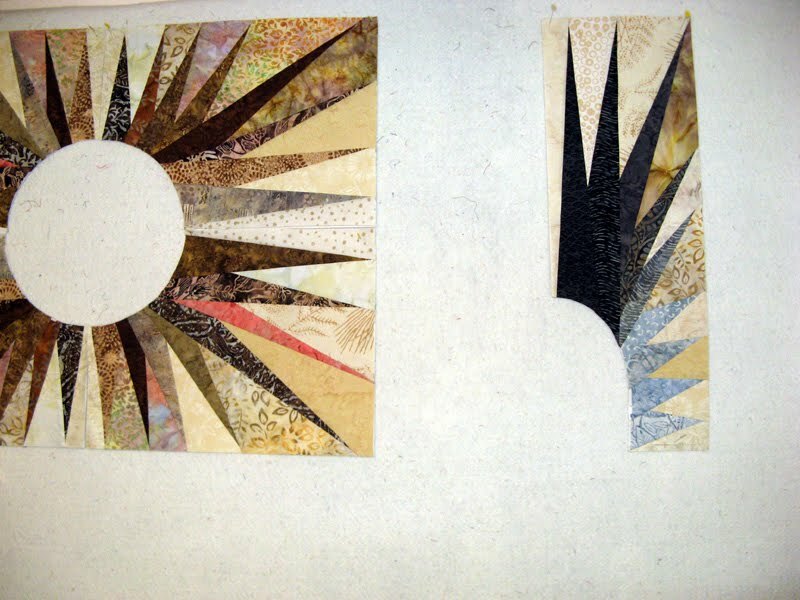 Not much change on Kayenne except some "reverse stitching". I decided against a much lighter background for some of the blocks. 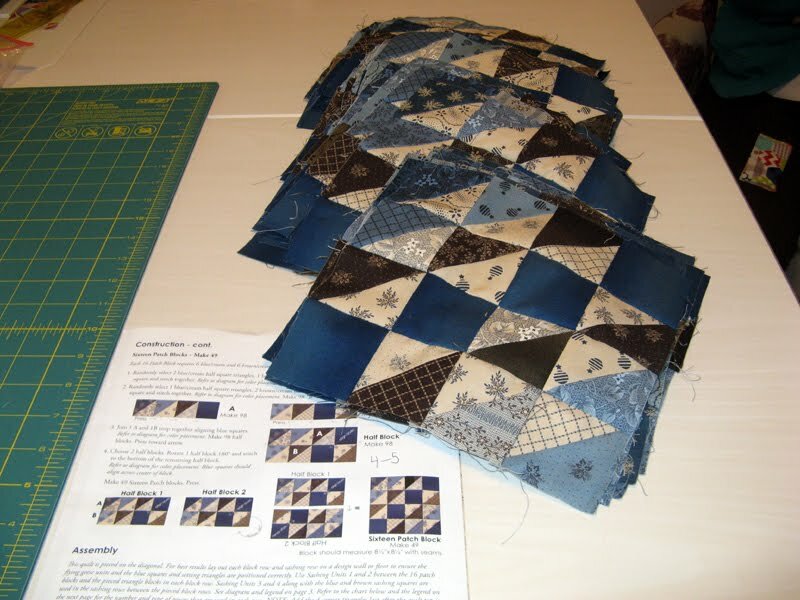 We both continue to get ready for the quilting retreat that starts on Thursday. A small detour on Wednesday on our way to the retreat hopefully won't leave us without change in our pockets! 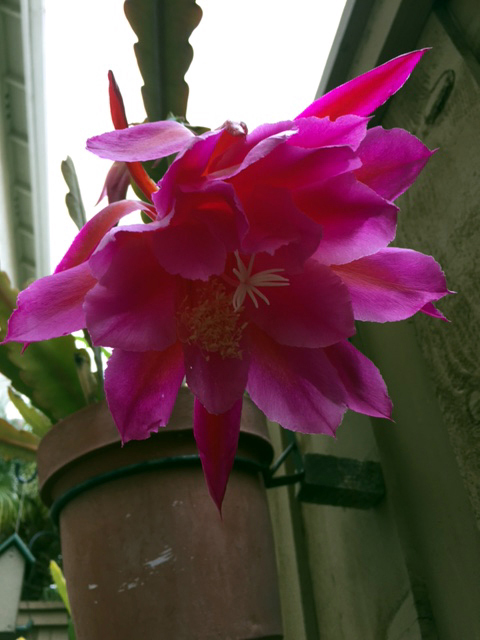 It has been a beautiful weather lately; hope that is the case in your area. See more with Judy's Patchwork Times. Not much to share today, but a small stash enhancement. Mom and I have been quite busy getting ready for the retreat that starts this Thursday. 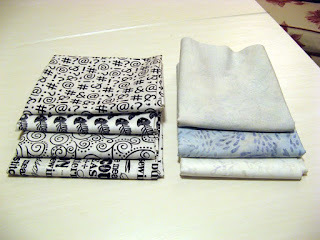 I did purchase a few FQs of white and black for a project I plan on making sometime in the future. 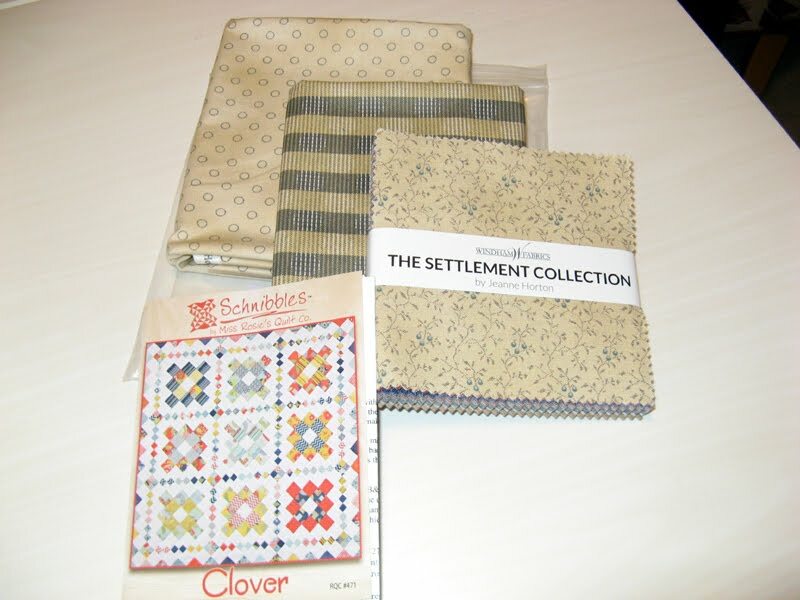 These purchases were made at Memory Lane in El Cajon. 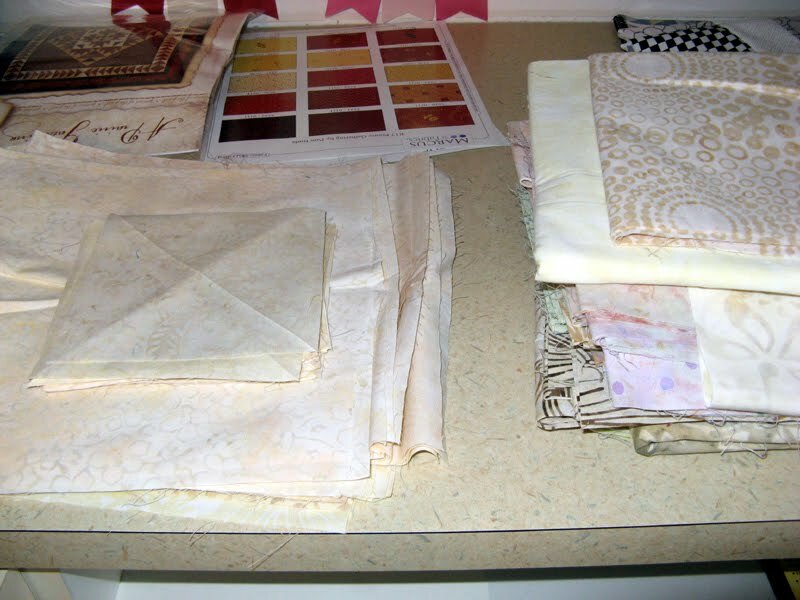 The neutrals on the right were intended for Kayenne, but I decided not to use them. The plan for Kayenne is to stick with more cream backgrounds throughout. These were purchased at Paradise Sewing in Poway. 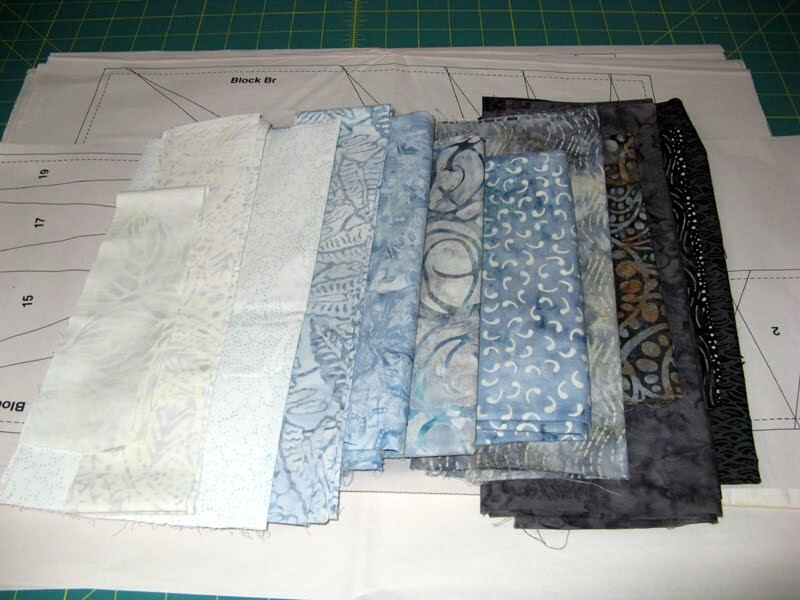 So for this week not much sewing. 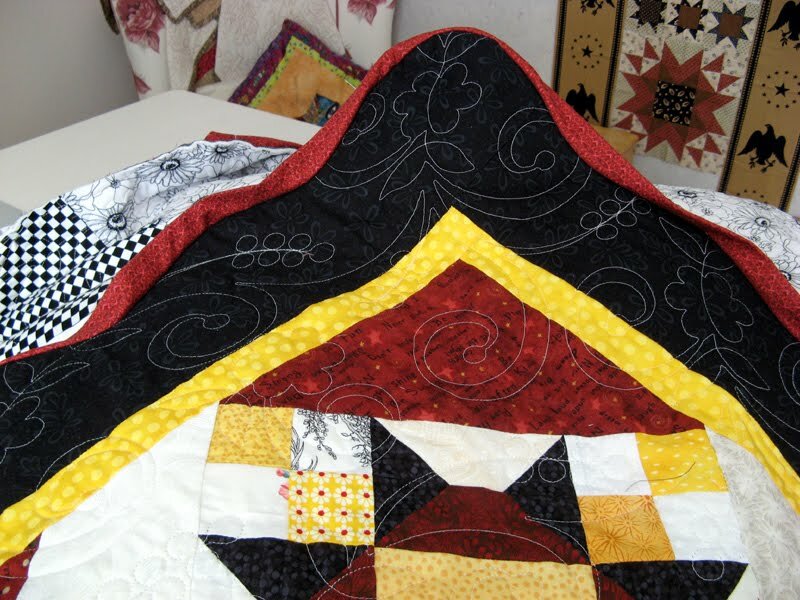 See more quilters using their stash through the links at Patchwork Times. Happy Dancing! Mom's to arrive in just a few hours from now... Adventures are planned. Stay tuned to learn what we do each day. Kayenne is on my design wall today...and on my sewing table! Not too much progress today. Tomorrow on my way home plans are made to visit Paradise Sewing in Poway. More background blues need to be found for the next blocks to be made. 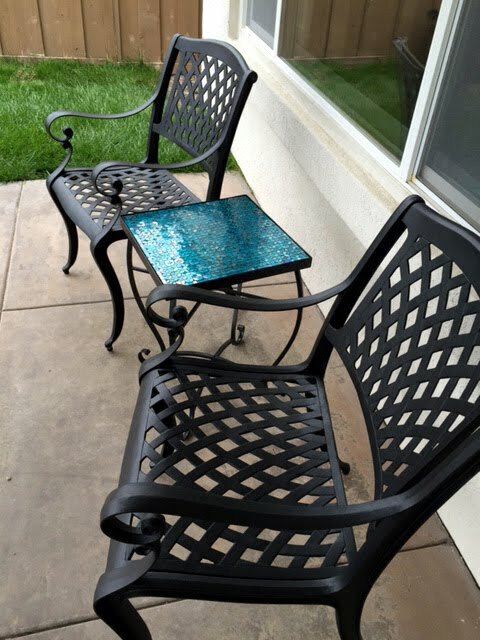 How do you like our new blue mosaic table? It arrived Friday; put together quickly for a nice finish to this grouping. I just may have to move these beautiful cactus orchids so that they can be appreciated more while in bloom. This is going to be a busy week. Excited that Wednesday brings my Mom here for a three week visit. We have many fun things to do during that time, but by far the best is simply sharing time together...hurry up Wednesday! 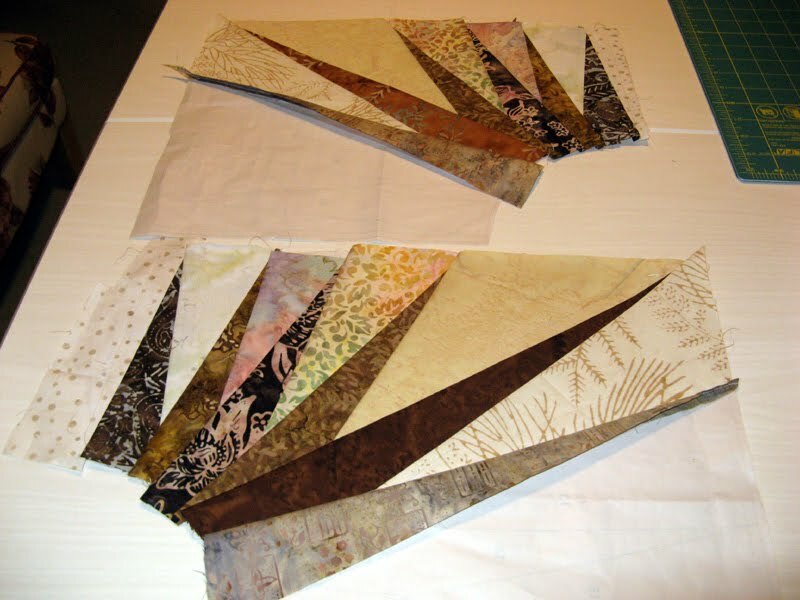 See more exciting projects through the links at Patchwork Times. Kontentment is completely finished except for a label. 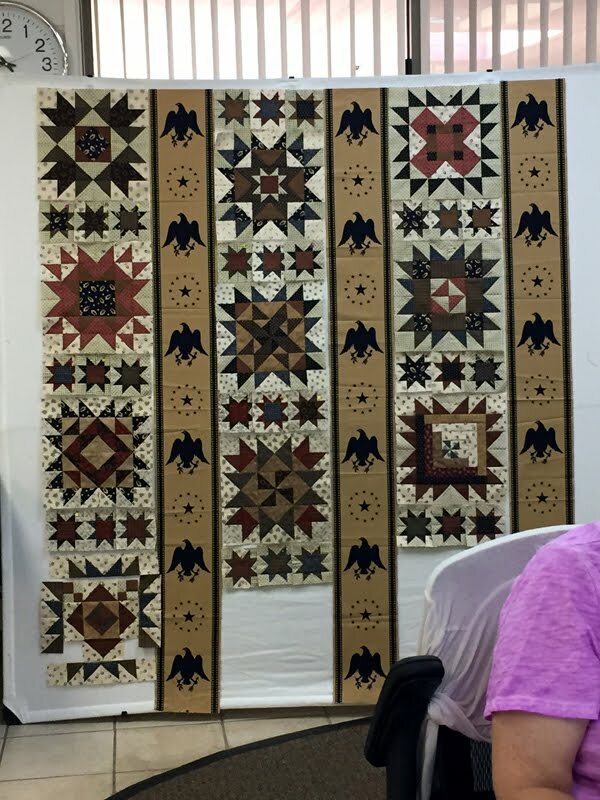 It was part of my Show and Share with Sunshine Quilters on Tuesday. 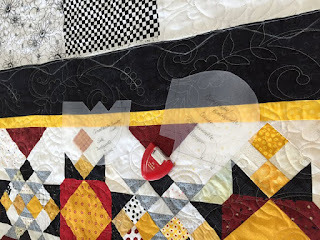 Everyone claims it is the most spectacular mystery project that Bonnie Hunter has shared with us yet. Being from the Washington, DC area it brings thoughts of the NFL Redskins Football Team. 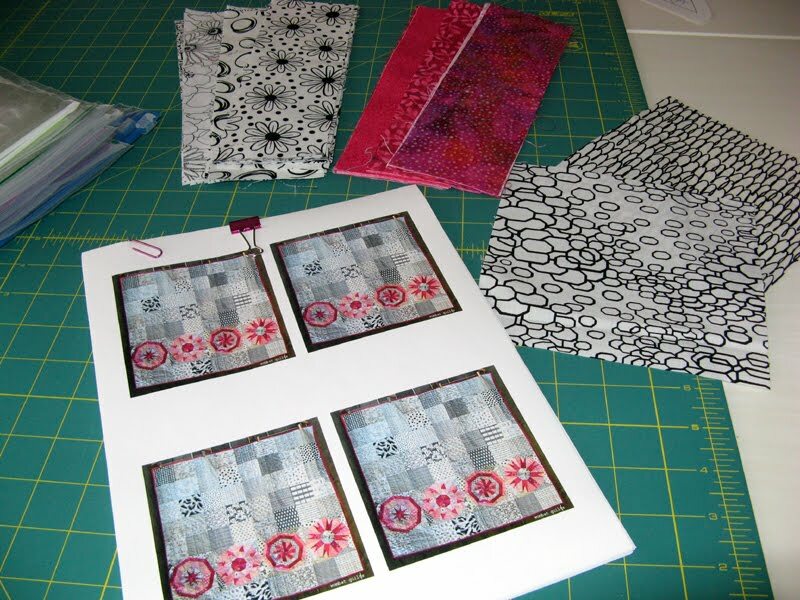 I mentioned that I would share the process behind the scalloped borders during a future Schools in Session to an enthusiastic membership. No stash to report as used since this was already done earlier in the year. 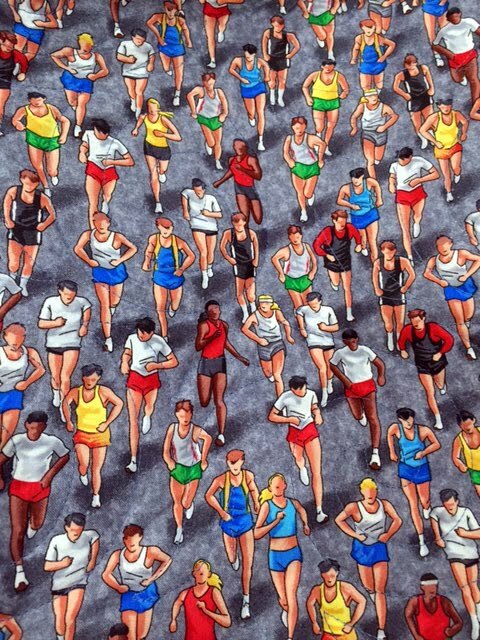 Isn't this the best possible fabric to use in the sashing and the back of a T-Shirt Memory Quilt for an outgoing track coach? 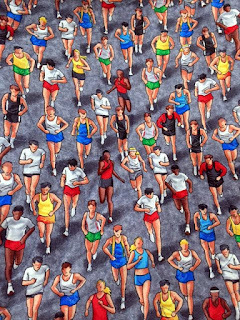 I enjoyed looking at all the runners (there are quite a few) while binding it. 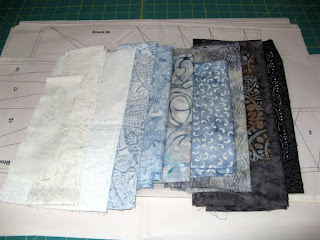 Finished project is ready for pickup...yes I will do binding. Nothing to claim here either. Kayenne is my May UFO. Five blocks are pieced with two more planned using the same fabrics. For this week it is a null...nothing used and nothing added. Next week's numbers are sure to be a bump up! 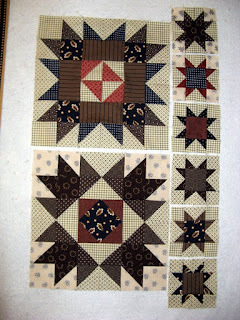 See more projects today through the links at Patchwork Times. 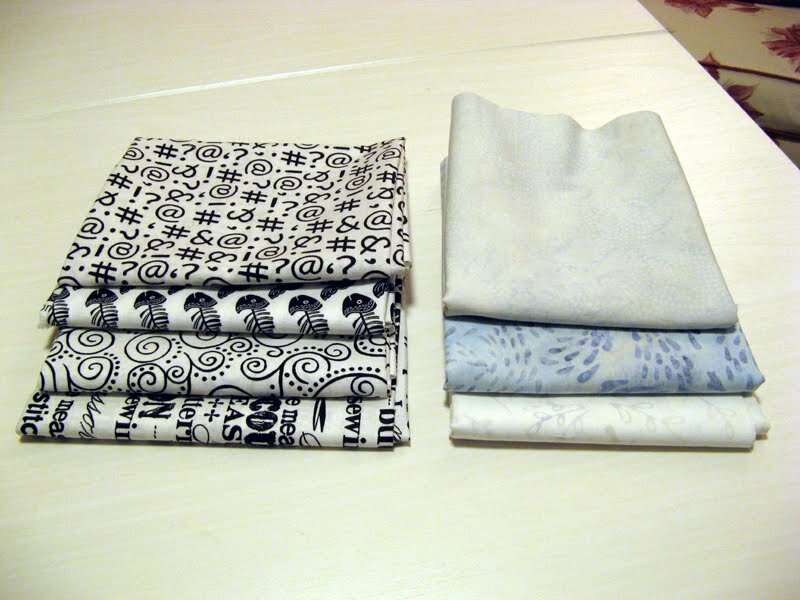 These are the batiks I plan to use for my project. I spent the entire day on Sunday binding Kontentment, but I finished it. Sleeve and label next...and then of course a photo to share with you! Enjoy your week. 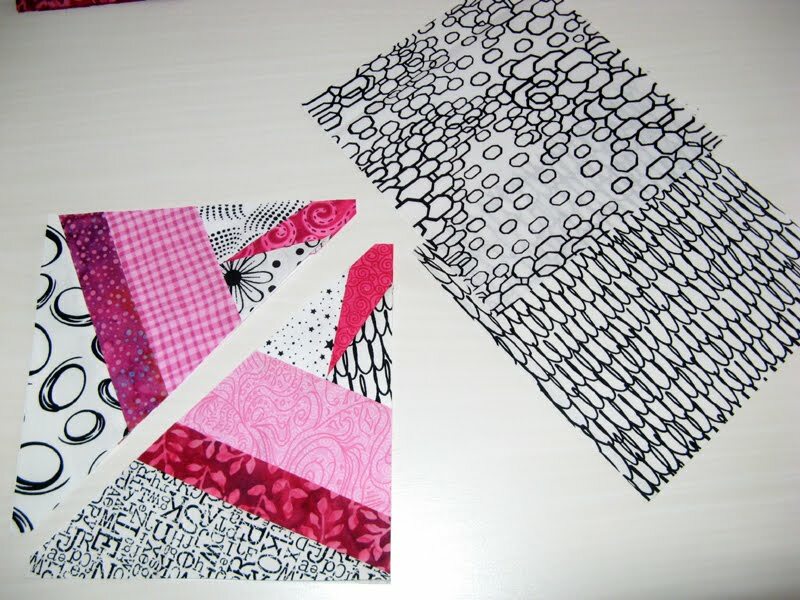 See more through the links at Patchwork Times. 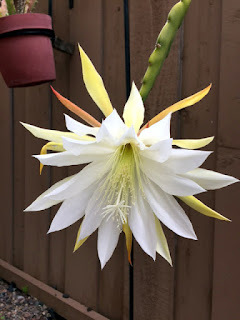 To start my post today...Happy Mother's Day! My Mom is coming in just ten days when our celebrating this special time of year begins. Truth be told, I sent her a card with an Olive Garden gift card and a Quilt Trivia board game about a week ago. I think the card and dinner at Olive Garden were the bigger hits =^.^= Ten days and counting before I can wrap her in my arms. We have fun plans during her three week stay including a quilting retreat. 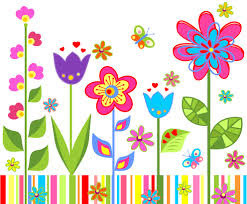 Again Happy Mother's Day to all the Moms. I have been busy as usual in my sewing room. 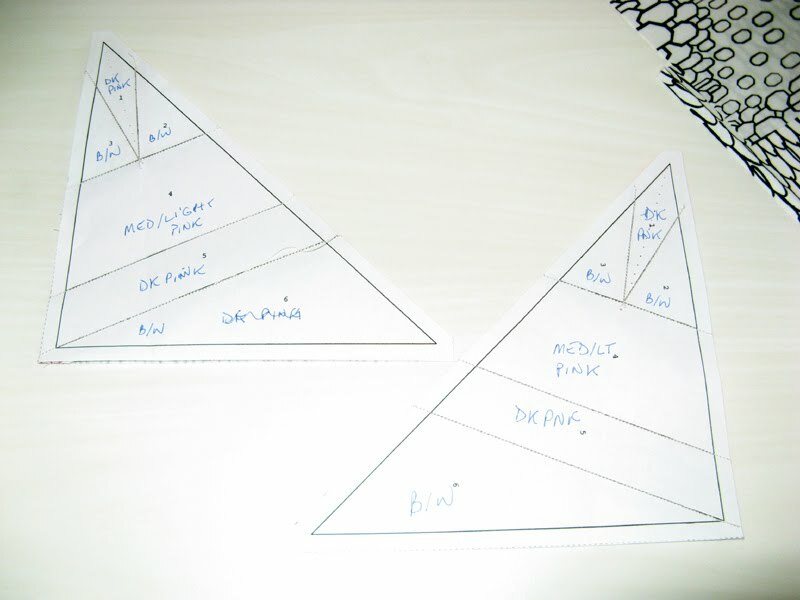 Today I have three projects to tell about. First up is Month 4 of Kalvery. I am caught up on this project, but May needs doing if I am to stay there. As for the BOM projects, Kanton Kull and Konstitution still need their April completed. 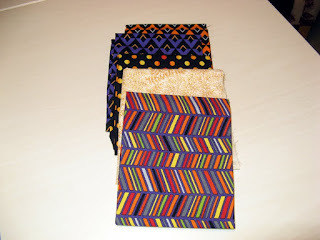 Fabrics have been pulled for Kayenne. This is not the best of photos; tomorrows will be better (so do come back then). 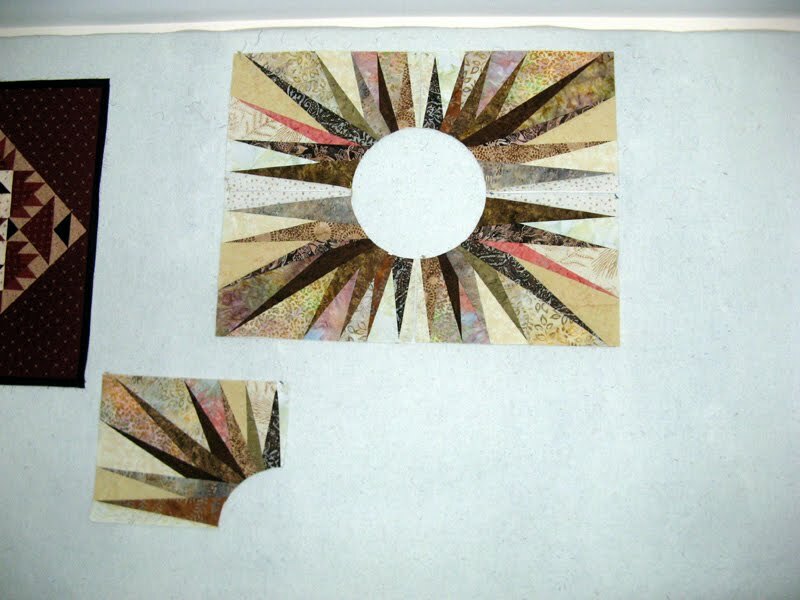 I will be using all batiks for this my May UFO project. To learn about it check out the right side bar under labels for Kayenne. 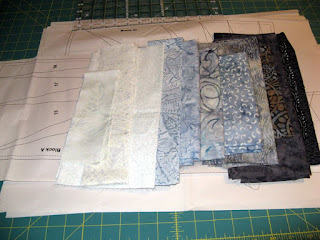 I will be sewing down the binding on Kontentment today. Seems like a good day to sit in my favorite chair and stitch while the washer and dryer are going. Perhaps Komotion will join me. Nothing to change my stats today, but as you can tell I am working on it! 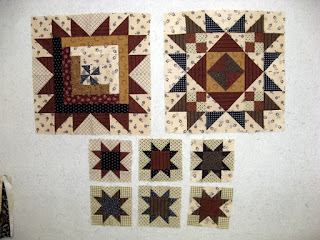 See other projects if you have time today through the links of Patchwork Times. I have Kanine Karnivores complete. Kerry will take it back on Tuesday for a few finishing quilting stitches around their faces. Placement of the eyes necessary for Kerry to finish the magic she creates. 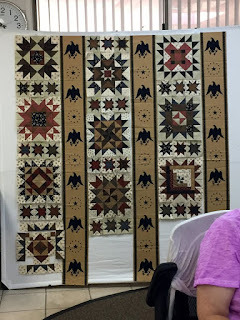 Marti of 52Quilts.com selected the next UFO to work on this month. I have a wonderful project that will be called Kayenne! The pattern has been in my bucket list for quite some time. The design is by Valorie Wells of the Stitchin' Post. 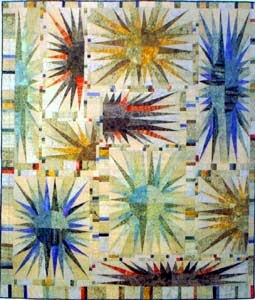 It makes a project that is 80" x 92. 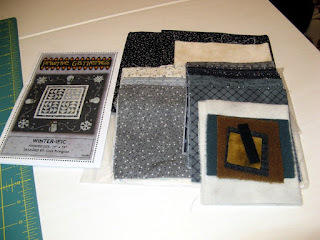 The original project was the 2007 Sisters Outdoor Quilt Show raffle quilt. This is certainly going to be a challenge to assemble as well as have it done in May! Much of Sunday was spent on preparing the BOM that I am coordinating for May's Sunshine Quilt Guild's meeting. The next photos are all about the project. I'll be spending time sorting through my stash tonight...wonder what it holds for Kayenne? 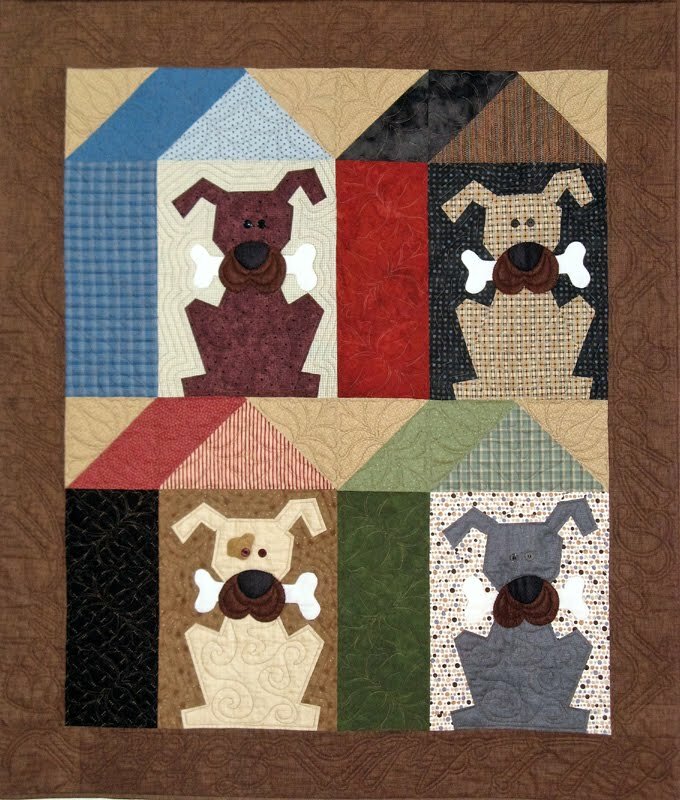 See more projects through the links of Patchwork Times. Nothing moving this week in my stash. Not a bad thing really. 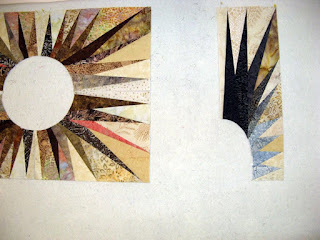 I have been concentrating on the finishing touches on Kontentment and Kanine Karnivores. I haven't started yet on the marking of the black outer border for the scallop edge that is planned for Kontentment (aka Allietare). 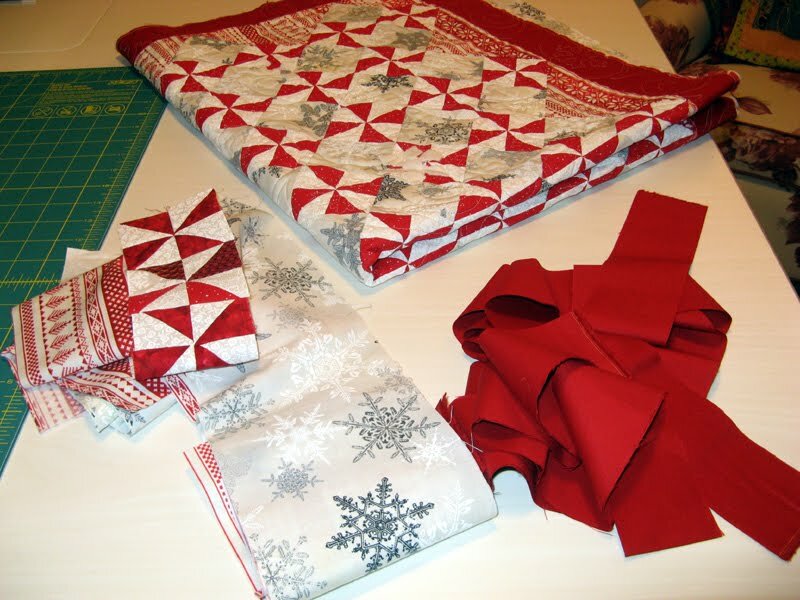 The decision was reached to use the red as the binding. Kanine Karnivores has binding machine sewn down; ready for the hand stitching and button eyes to be applied. 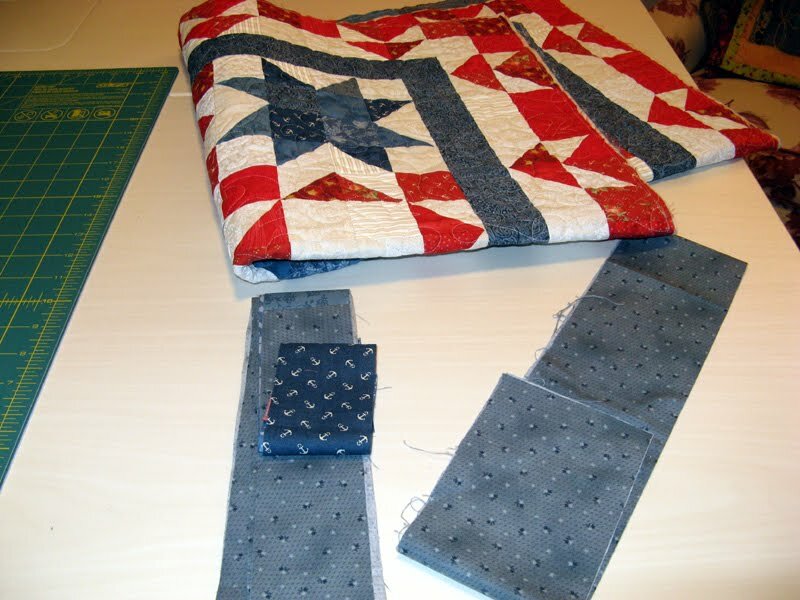 This project will go back to Kerry for some final quilting stitches around the eyes. I suppose if I wanted to claim the little bits of fabrics that I pulled from my stash for the Sunshine Quilt Guild April BOM coordinated by Teresa I could. It does become difficult with pieces not much larger than 4" x 6". 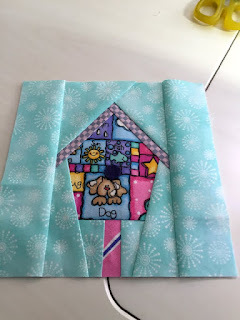 The purple circle still needs to be stitched down, but isn't the bird house cute? 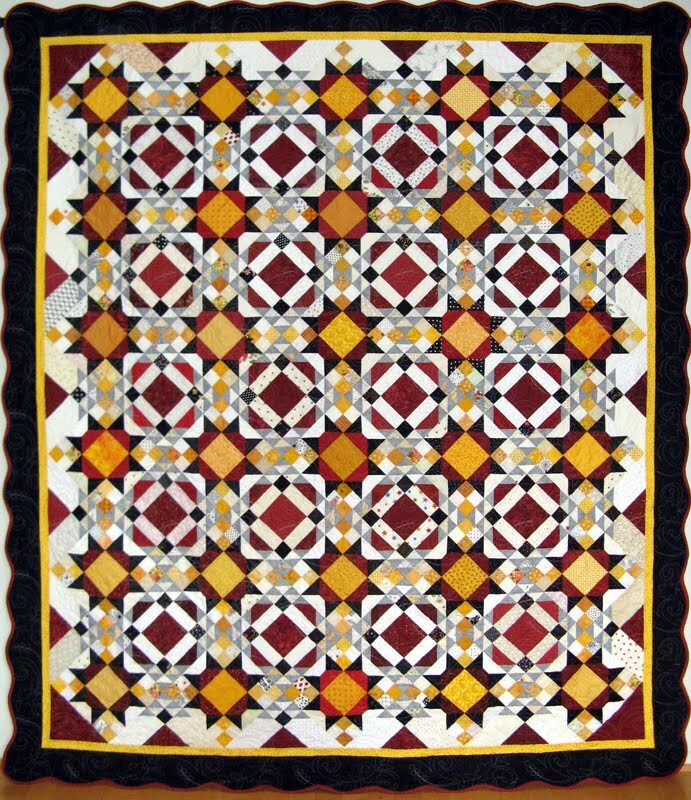 Here are my numbers as May begins... See more quilters using their stash at Patchwork Times.